In this pack you will find colors that are grayed, or 'dusty', and will work very well with grayer color palettes and fabrics. Presencia Perle Cotton is 100% extra-long staple Egyptian cotton, mercerized for strength, colorfast, bleachfast* and shrinkfast. 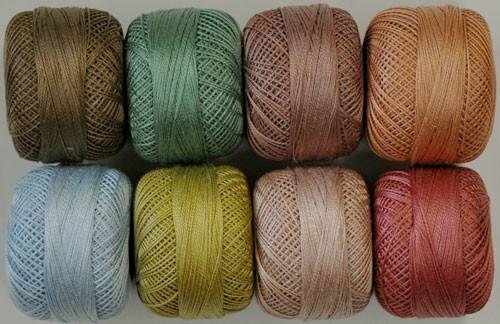 One 10-gram ball of size 3 perle cotton has approximately 30 yards of thread. I like to use this thread to make very visible stitches on wool. Don't forget to order needles - I recommend the #18 Tulip Chenille needle. You might also like to try the Tulip Chenille Needle Assortment. Use the chart below to compare the different weights of thread. * All colors are Bleachfast except 1163, 1166, 3802, 3810, & 3822. These colors are Colorfast but not Bleachfast.